As noted here last week, on December 9th the BBC News website produced the corporation’s first English language report of the year on the topic of missiles fired from the Gaza Strip – despite numerous other attacks having taken place throughout 2017. “Israel has carried out fresh air strikes in the Gaza strip on what it said were military facilities belonging to the Islamist group Hamas. The Israeli military said its aircraft had targeted training camps and weapons storage compounds. However, BBC audiences were not told that the missile that fell short reportedly hit a school in Beit Hanoun in the northern Gaza Strip – which was fortunately empty at the time. “Earlier on Wednesday night, four rockets were fired from Gaza at southern Israel. Two of them were intercepted by the Iron Dome missile defense system, a third struck an open field and the fourth fell short of the border and hit a school in the Gaza Strip, according to Israeli officials. On December 15th yet another rocket fired by terror groups in the Gaza Strip fell short, also reportedly hitting a structure in Beit Hanoun. Despite the BBC being one of the few media outlets to have a permanent presence in the Gaza Strip, no mention of that shortfall missile appeared in the BBC News website’s December 15th report titled “Jerusalem: Palestinians killed in fresh clashes with Israel“. Remarkably, despite the recent uptick in missile fire from the Gaza Strip the BBC has not sent any of its Jerusalem-based correspondents to report from the Israeli communities affected by those attacks. As we see – and not for the first time – the corporation also continues to ignore residents of the Gaza Strip who fall victim to shortfall rockets fired by terror groups in the territory. Less than 24 hours later, an additional missile hit the Eshkol district and Israel later responded. “A rocket was launched from the Gaza Strip early Monday morning and landed near the Gaza border fence in Israel’s southern Eshkol region. The Israel Defense Forces said that there were no reported injuries or damages. Moreover, the “red alert” alarm that usually sounds fifteen seconds in advance of an incoming rocket before it lands, did not go off, which the IDF explained was a result of its heading towards an unpopulated area. 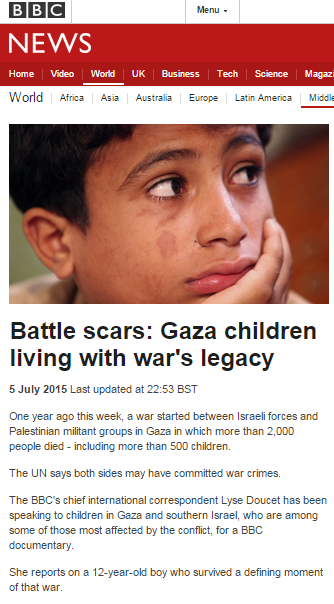 Promotion for Lyse Doucet’s programme ‘Children of the Gaza War’ – timed to be broadcast on the anniversary of the beginning of Operation Protective Edge on July 8th – has been appearing, inter alia, on the BBC News website and on social media. 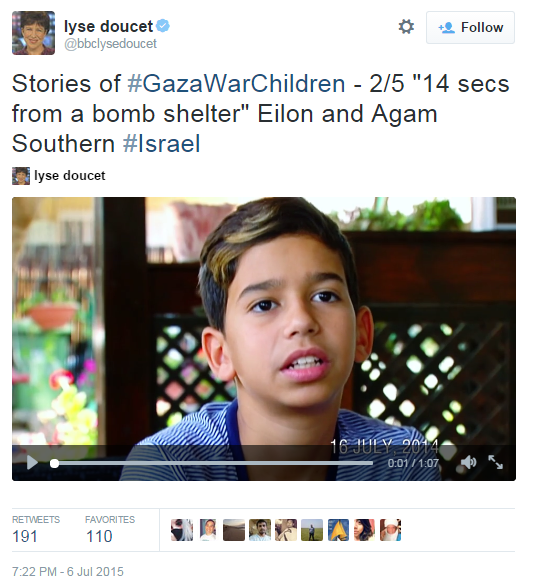 From the second of those Tweets from Lyse Doucet we learn that whilst the BBC was filming in southern Israel on July 16th 2014 it caught an incoming missile alert and the resulting scramble of two children to their home’s fortified safe room on camera. Insofar as we are aware, that footage was not shown to BBC audiences at the time. 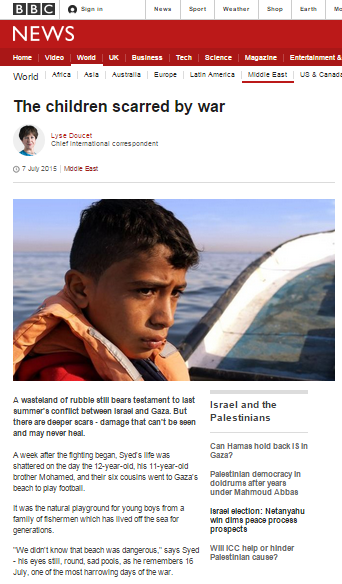 Visitors to the BBC News website on July 5th found a filmed report by Doucet titled “Battle scars: Gaza children living with war’s legacy” and two days later a written report by Doucet also appeared in the ‘Features’ section of the website’s Middle East page under the headline “The children scarred by war“. 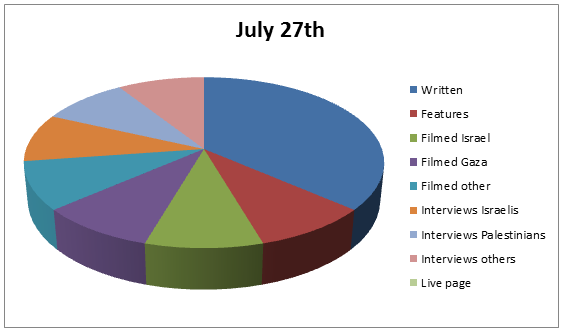 Of the 1,086 words making up that article, two hundred and thirty-six can be categorized as background information. The Israeli children’s side of the story is told in two hundred and sixty words and five hundred and ninety words are devoted to the stories of Palestinian children. 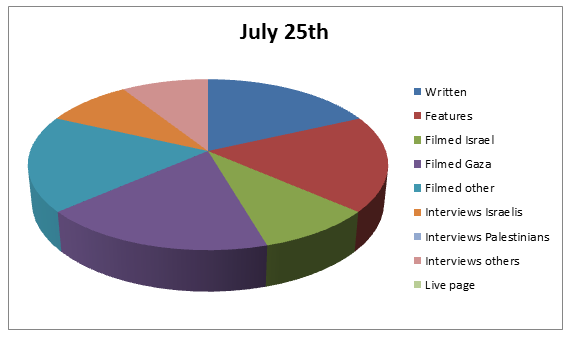 One can only hope that the upcoming programme itself will show better balance. Among the notable aspects of Doucet’s written report is a curious focus on why her first interviewee was where he was when disaster struck. “A week after the fighting began, Syed’s life was shattered on the day the 12-year-old, his 11-year-old brother Mohamed, and their six cousins went to Gaza’s beach to play football. It was the natural playground for young boys from a family of fishermen which has lived off the sea for generations. Doucet makes no effort to inform readers that – as noted in the MAG report on the incident – the location was known to be a Hamas site and that prior events made the fact that it was dangerous clear. 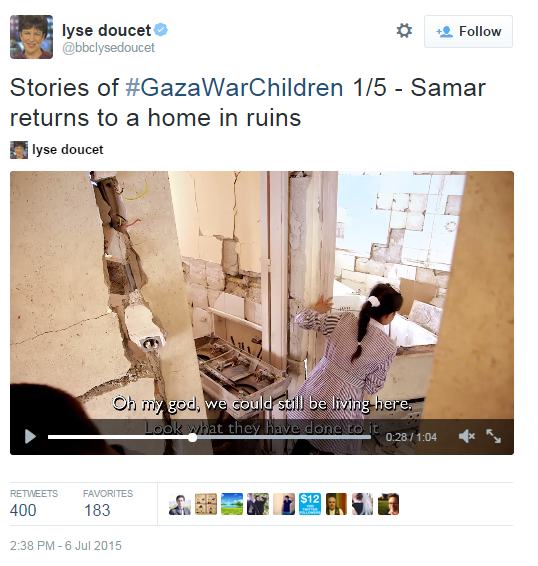 In a video clip embedded into the article, Doucet tells audiences that the apartment she visits together with a girl called Samar “lies next to the main crossing with Israel”. That information would suggest that the area is in Beit Hanoun but Doucet makes no effort to inform viewers of the highly relevant context of the terrorist activity which took place in that district. 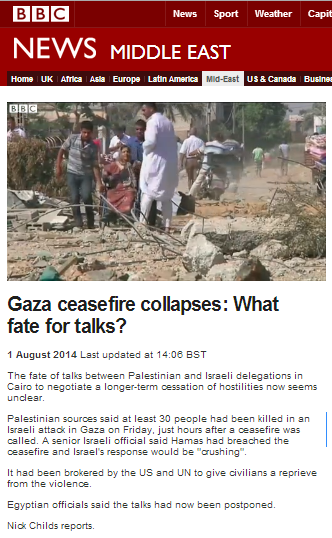 Throughout the past year, the BBC has repeatedly quoted and promoted casualty figures sourced from Hamas agencies and/or UN bodies relying on information from Hamas agencies and sympathisers. No independent BBC verification of the figures or of civilian/combatant casualty ratios has been made available to the public. 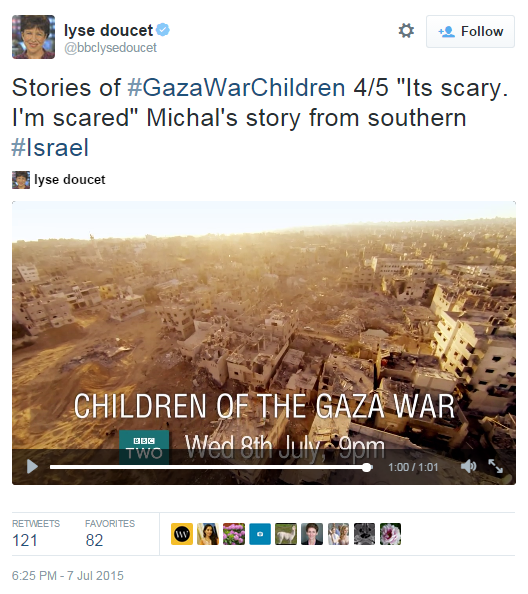 Hence, BBC audiences cannot know whether or not the number quoted by Doucet includes child combatants, terrorists presented with false ages or even those killed by short-falling missiles fired by terrorist organisations such as the children killed in Shati on July 28th 2014. 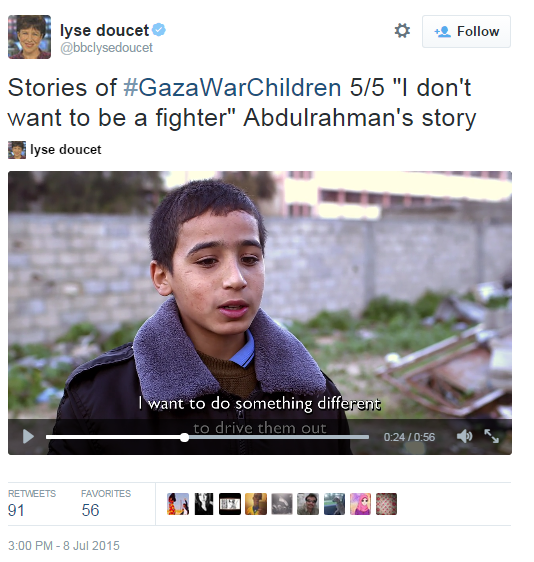 Doucet’s article also includes promotion – including a link – of a very one-sided and context-free report from the political NGO ‘Save the Children’ which relates almost exclusively to children in the Gaza Strip and manages to avoid all use of the words terrorism or Hamas. 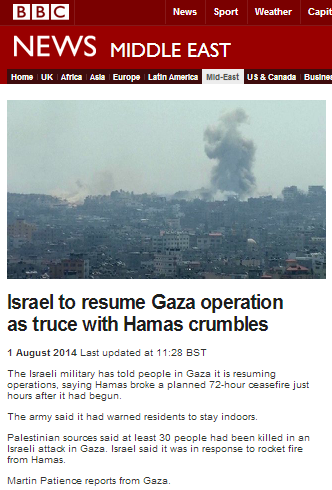 The BBC knows full well that Operation Protective Edge commenced after hundreds of missiles were fired by terrorist groups at civilian targets in Israel in the preceding weeks and following considerable efforts to persuade Hamas to stop those attacks. It also knows that thousands more rockets and mortars were fired during the period between July 8th and August 26th and what was the aim of the cross-border tunnels constructed by Hamas. It therefore has no justification for presenting that information with the qualifier “Israel says”. Likewise, the BBC knows perfectly well that Israeli airstrikes were responses to missile fire on Israeli civilians and that the ground operation was necessary in order to decommission the cross-border tunnels. It also knows – even though it does not tell its audiences – that the border restrictions are the result of a decade and a half of terrorism by Hamas and other terror groups located in the Gaza Strip. 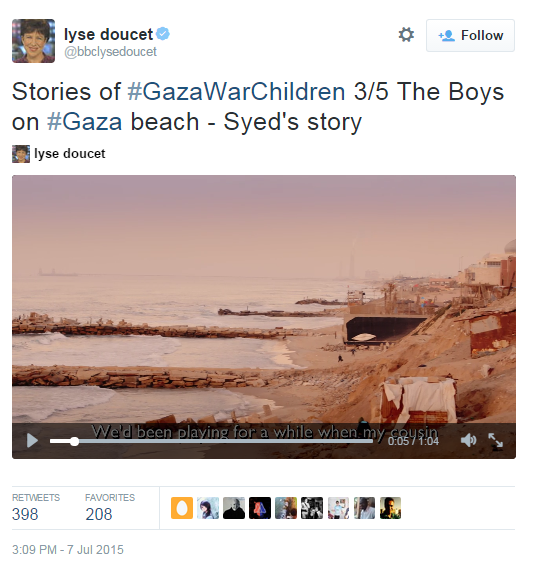 Doucet’s equivocal presentation of the background to Operation Protective Edge therefore does not represent an effort to meet editorial standards of impartiality but an active attempt to promote misleading ambiguity regarding the causes of the conflict. One can only hope that a higher standard of journalism will be evident in the programme to be aired to UK audiences tonight on BBC Two and to viewers elsewhere this coming Saturday on BBC World News television. 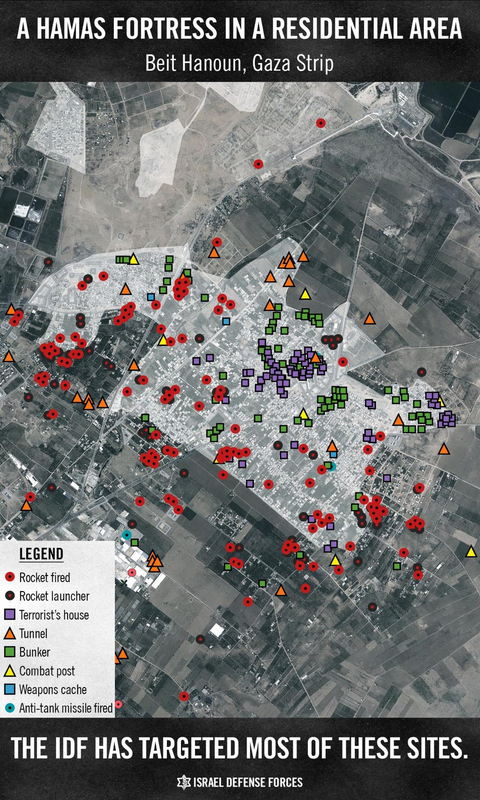 Of the 3,356 missiles fired at civilian targets in Israel by terrorists in the Gaza Strip between July 8th and August 5th 2014, 69.4% were fired from the northern part of the territory with the towns of Beit Lahia and Beit Hanoun being major centres of missile fire, cross border tunnels and other terrorist activity. 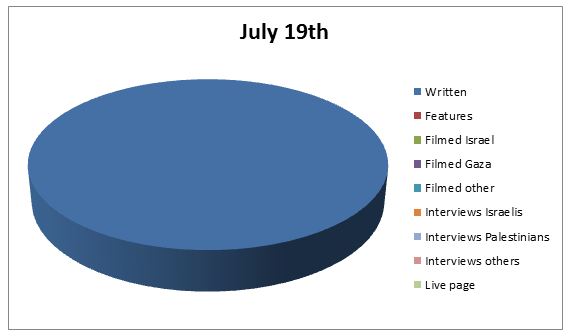 But viewers of Jon Donnison’s filmed report (heavily promoted on his Twitter feed) of August 5th – which, in addition to being broadcast on BBC television news, appeared on the BBC News website’s Middle East page under the title “Gaza truce holds as residents return to destroyed homes” – would never have known that even one missile was fired from Beit Hanoun or that fierce battles took place there when Israeli soldiers went in to decommission cross-border attack tunnels and missile launchers, with terrorists using the local houses as sniper positions. Israel has of course not occupied the Gaza Strip for nine years and the major towns and cities in Judea & Samaria have been under PA control for nearly two decades, but Donnison sees no need to spoil the narrative by informing BBC audiences of the facts. Of the 3,356 missiles launched by terrorist organisations at Israel during the past four weeks, four hundred and seventy-five landed inside the Gaza Strip. Many residential homes were booby-trapped by the terrorists, to the extent that when the IDF informed the residents of Beit Hanoun that they could return to their homes, that message also came with a warning to beware of explosives still in place. Jon Donnison, however, knows without any shadow of a doubt what caused the damage he films extensively in Beit Hanoun. Donnison makes no attempt whatsoever to inform audiences that the restrictions on the entry of dual-use goods into the Gaza Strip are aimed at curbing the type of terrorist activity which brought about the border restrictions in the first place. He intentionally misrepresents the topic of agricultural (and other) exports from the Gaza Strip: in 2012/13 for example, over 842 tons of agricultural produce was exported from Gaza via Israel, along with 12.2 million flowers. 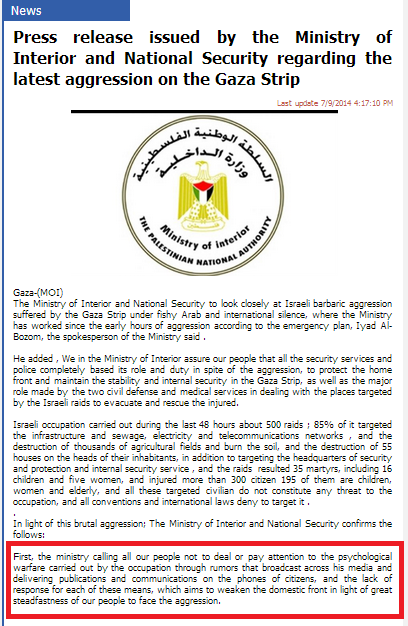 Clearly Jon Donnison remains on Hamas PR campaign message, promoting context-free images and descriptions of damage and civilian suffering without even a whiff of a mention of terrorist activity in Beit Hanoun. His promotion of a non-existent “military occupation” of the Gaza Strip and of the notion of farmers unable to export their agricultural produce because of a “blockade” he fails to explain also conforms perfectly with the Hamas narrative currently being vigorously promoted. The fact that there is no truth to those notions obviously does not disturb Jon Donnison – or his employers – in the least. 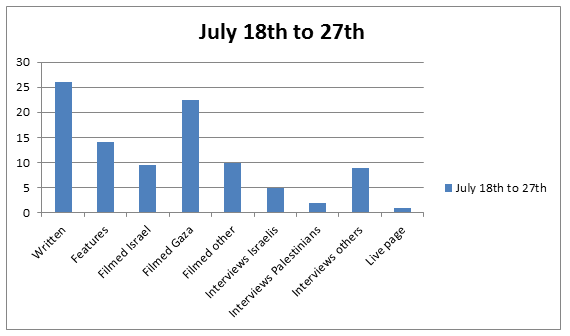 The volume of Israel and Gaza Strip-related content appearing on the BBC News website’s Middle East page over the past few weeks has been so high that readers might have had difficulty keeping up with all the content published. 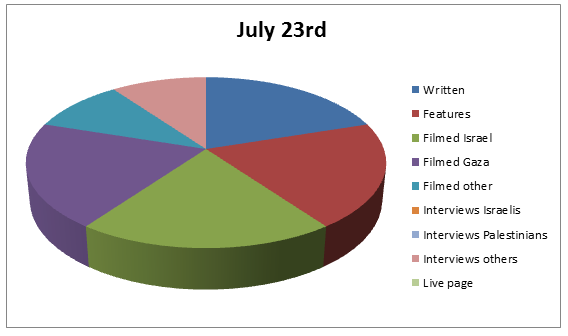 One interesting item which may have slipped under the radar is titled “Gaza conflict: Disputed deadly incidents” and it appeared on July 31st. “Since the start of the Israel-Gaza conflict, there have been a series of deadly incidents for which each side has blamed the other. UN facilities serving as shelters are among the sites hit. 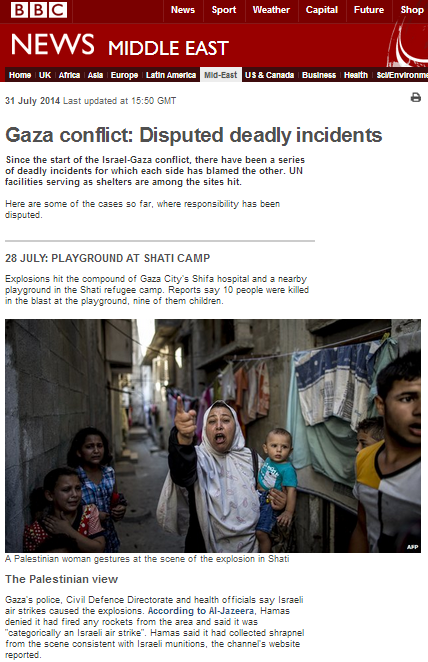 The first of the BBC’s “disputed” events is the explosion in the Shati area of Gaza on July 28th in which a missile fired by terrorists hit a playground killing ten people including eight children. As readers no doubt recall, soon after the incident took place the IDF stated that it had not been operating in the area at the time and publicized aerial photographs showing the trajectories of that missile and three others fired at the same time as recorded by IDF radars and sensors. The BBC’s presentation of that incident, however, places data gathered from sophisticated tracking equipment on a par with the unverified verbal claims of assorted bodies all ultimately run by a proscribed terrorist organization. 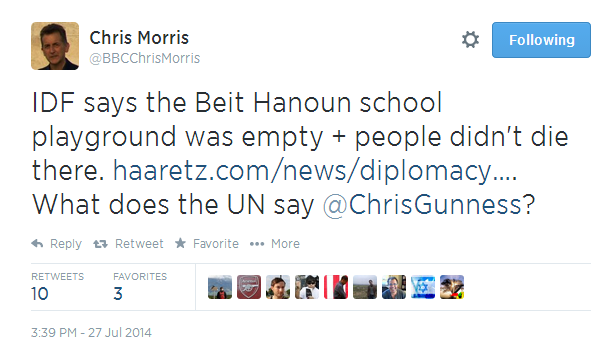 The second incident described by the BBC as “disputed” occurred on July 24th at a UN school in Beit Hanoun. Palestinian terrorists fired anti-tank missiles at IDF forces operating in the area from the vicinity of the school. The IDF returned fire and one errant mortar landed in the schoolyard, but filmed documentation showed that the schoolyard was empty at the time. In this case too, the BBC presents audiences with a view which puts unproven claims made by a representative of a body run by a proscribed terrorist organization on a par with filmed evidence. It should of course be the aim of BBC journalists to cut through the propaganda of a terrorist organisation with a self-declared interest in promoting a public relations campaign based entirely on the inflation of civilian casualty numbers, in order to enable audiences to form a clear, fact-based understanding of events. 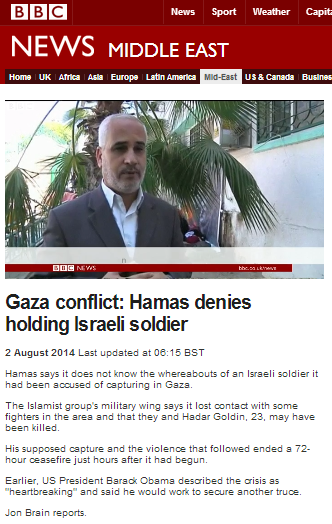 Unfortunately for its audiences, the BBC has in far too many cases over the past few weeks elected instead to take the approach of presenting Hamas’ assorted unproven claims as plausible without making any effort to independently verify those assertions. 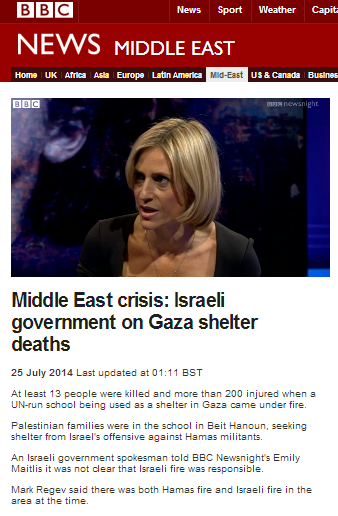 Moreover, the BBC has consistently refrained from providing BBC audiences with factual, comprehensive information on the use of the civilian population of the Gaza Strip as human shields and its presentation of these two clear examples of that practice as “disputed” further compounds that failure and actively hinders the ability of members of the audience to reach informed, fact-based opinions. The BBC’s uncreative presentation of these two incidents in terms of “each side has blamed the other” may go a long way towards pandering to domestic fashionable relativism but it certainly does not do the job for which the BBC exists. But beyond the issue of the failure to meet its own public purpose remit, this article – like much other BBC reporting coming out of the Gaza Strip in the last few weeks – raises a very simple, yet troubling, wider question about BBC journalism. If a Western government deliberately endangered civilians by placing military assets in residential areas on the premise that enemy forces would be less likely to strike back, the BBC would – one hopes – see it as its fourth estate duty to expose that practice. If a Western government launched missiles which fell short and killed children playing in a park, or drew fire by firing anti-tank missiles from the vicinity of a school, the damning headlines would – one assumes – soon follow. The people of the Gaza Strip, who of course have no free press of their own, have not however seen any criticism – or even documentation – of their abuse by the terrorist organisations which hold them hostage from the Western journalists located there. This article is what it looks like when the BBC chooses to waive its fourth estate role. In this post we will look at the way in which the breakdown of the August 1st humanitarian ceasefire – breached after 90 minutes by Hamas terrorists who staged an attack on IDF soldiers decommissioning a cross-border tunnel near Rafah – was presented to viewers of BBC television news. 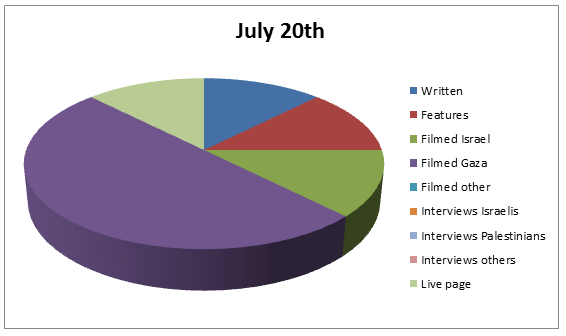 For the timeline of events see part one of this post. 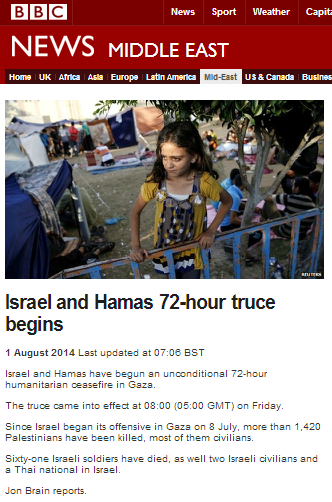 Early on the morning of August 1st – before the humanitarian ceasefire had been breached – viewers of BBC television news saw a report by Jon Brain titled “Israel and Hamas 72-hour truce begins” in its website version. Brain opened that report with more of the BBC’s context-free presentation of casualty figures it has not independently verified. Significantly, he does not however inform them that those breaches of previous ceasefires were all carried out by Hamas. Did Patience almost slip up there and say “at least four Palestinian militants”? The report itself makes no attempt to inform audiences why the humanitarian ceasefire collapsed. 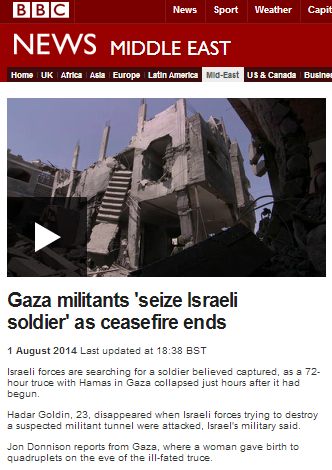 On the evening of August 1st viewers saw a report by Jon Donnison, which appears under the inaccurate and misleading title “Gaza militants ‘seize Israeli soldier’ as ceasefire ends” on the BBC News website. The actions of the Hamas terrorists were in fact what ended the ceasefire: they did not – as this title suggests – occur at the end of the ceasefire. Donnison then moves on to Beit Hanoun, failing to inform audiences that the area has been a major location of missile fire into Israel or to raise the very realistic possibility that some of the damage to buildings his cameraman films extensively may have been the result of the terrorists’ practice of booby-trapping houses: a subject which the BBC has not touched at all in any of its coverage. He goes on to address the topic of the breached humanitarian ceasefire, notably presenting events in an inaccurate order which misleads viewers. Contrary to Donnison’s statements, the incident in which 2nd Lt. Goldin was abducted was the event which breached the ceasefire and it took place before any “Israeli airstrikes”. 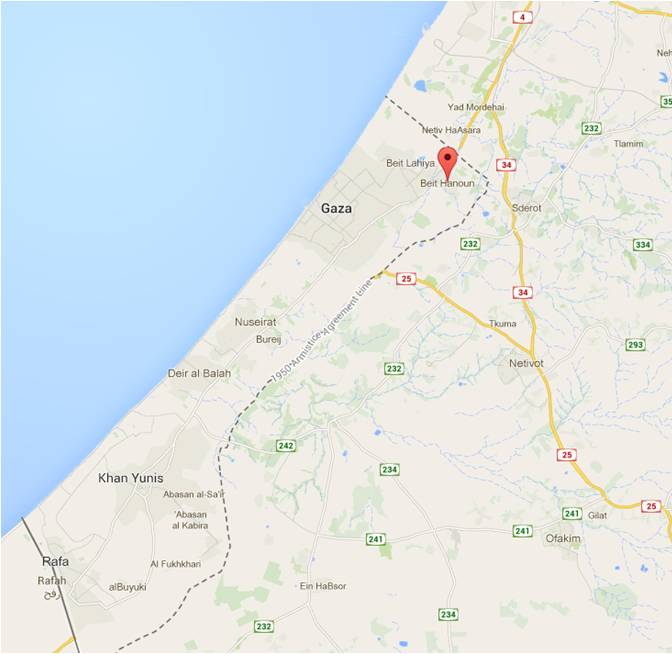 It also took place near Rafah – not, as Donnison claims, on the Israeli side of the border. Equally inaccurate is Donnison’s later claim that Gilad Shalit was abducted “in Gaza”. That incident did take place on the Israeli side of the border. 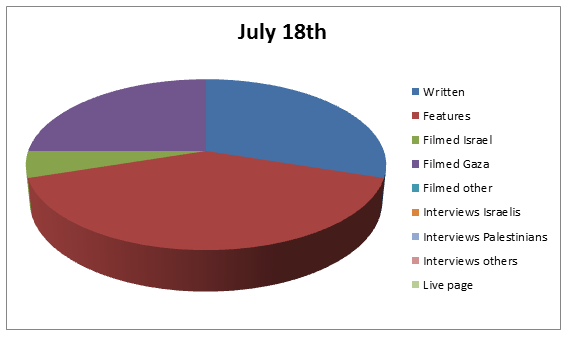 Another filmed report shown to viewers of BBC television news was produced by Ian Pannell. 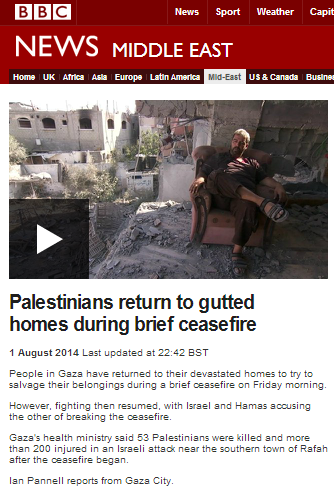 It also appears on the BBC News website under the title “Palestinians return to gutted homes during brief ceasefire“. Like his colleague Jon Donnison, Pannell fails to provide viewers with the information necessary to provide context to the scenes of damaged buildings shown in his report. Pannell’s description of the collapse of the ceasefire starts out accurately from a chronological point of view, but notably he fails to identify the party which initiated the violence, promotes some Hamas propaganda and fails to inform viewers how many of those killed in Rafah were terrorists. However, Guerin repeats the same inaccuracy which appeared in Jon Donnison’s report regarding the location of the abduction of Gilad Shalit in 2006. 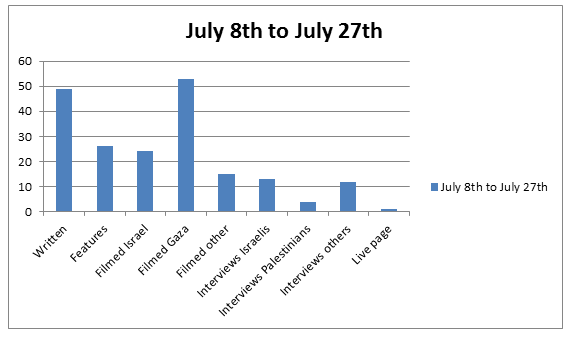 Still later in the report, Guerin visits Kibbutz Kfar Aza and for the first time, BBC audiences hear – albeit very briefly – that not just people in Gaza have been displaced from their homes during this conflict, but Israeli residents of communities near the border too. 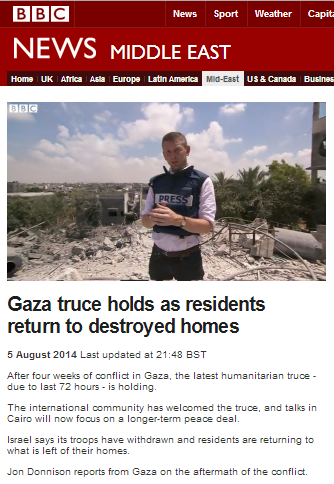 In contrast to the ample reporting on the topic of displaced persons in the Gaza Strip, the subject of displaced Israelis has not been covered at all by the BBC. A report by Jon Brain from the morning of August 2nd (“Gaza conflict: Hamas denies holding Israeli soldier“) seems to start promisingly when it presents the abduction and the later fire on Rafah in the correct chronological order. However, that report soon descends into promotion of Hamas propaganda, including an interview with Hamas’ Fawzi Barhoum. 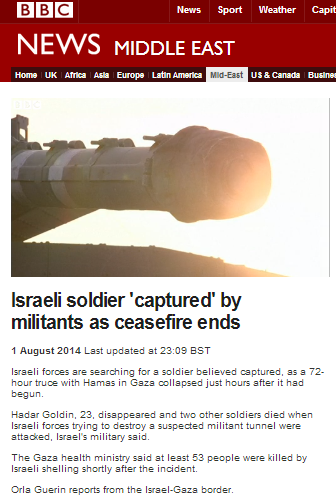 Significantly, neither Brain nor any other BBC journalist reporting on this issue bothered to clarify to audiences that the Israeli soldiers who were attacked were in the process of decommissioning one of Hamas’ attack tunnels at the time – in line with the terms of the ceasefire. 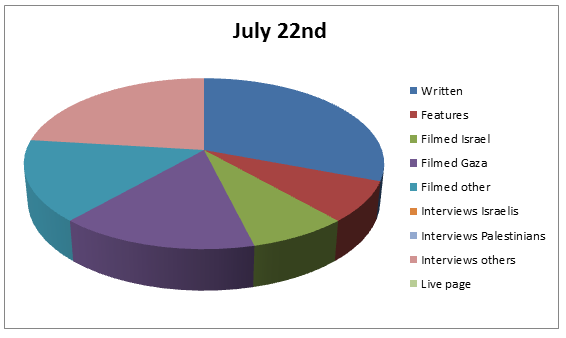 As we see from this selection of filmed reports shown to viewers of BBC television news, the majority of them – like the BBC News website’s written reports discussed in the previous post – come nowhere near to informing audiences clearly, accurately and impartially of the event which breached the humanitarian ceasefire of August 1st. That failure is exacerbated by the amplification of Hamas propaganda which only serves to further prevent audiences from properly understanding why this latest ceasefire failed.